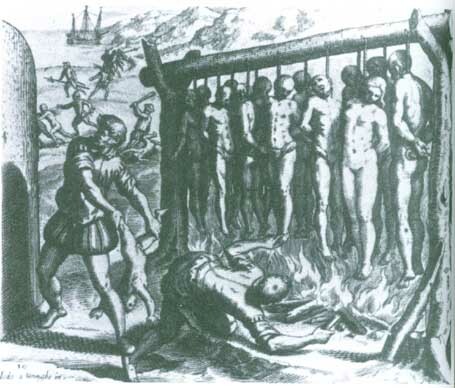 Ben Carson: African ‘slaves’ were ‘immigrants’! On Monday, Afro-American Housing and Urban Development (HUD) Secretary Ben Carson exonerated his Jewish ancestors of African slavery. Israel First Ben Carson, making his first speech to the HUD staff since his confirmation last week, said that the so-called tens of millions of Africans brought in chain to America and sold like animals, were in fact Black immigrants who dreamed of better lives for their children. So why you think Ben Carson who opposed the US-Iran nuclear agreement as tantamount to a new Jewish Holocaust by Iran would make such a stupid statement? Simply, because when he was one of the GOP presidential contenders against Donald Trump – he had boasted that his African ancestors were Jewish. Ironically, Carson’s Black Jewish sister Whoopi Goldberg called him moron. “From the man who thought the pyramids were built for grain silos and called the Big Bang Theory ridiculous, comes a brand new epic,” she commented on Tuesday. Two Israel Firsters Afro-American actor Samuel L. Jackson, and Steven Goldstein, executive director of the Holocaust Industry also agreed with Whoopi Goldberg. Ben Carson who has no experience in housing policy, rarely addressed the issue directly. Instead, he focused heavily on his experience as a neurosurgeon, which he argued has prepared him to work toward accomplishing the department’s missions. Well, any idiot who believed Netanyahu’s absolving Hitler of Jewish genocide – he is free to believe the story behind the film Roots was written by anti-Israel Minister Louis Farrakhan. If someone study history of African slavery from an objective source he will learn it began in 1619 and ended in 1960s. However, it still exists under other names. Holocaust Mughal Steven Spielberg in his 1997 movie Amistad is about Africans sold into slavery in 1839 who revolt and commandeer a slave ship with the intention of sailing back to Africa. However, Zionist Jew ignored the fact that many among the slaves who revolted were Muslims. This entry was posted in General and tagged Jewish crimes. Bookmark the permalink.